This year, instead of trashing them, or simply bagging them up & stuffing them into the goodwill dumpster, why not use this idea to earn back some of that hard earned cash to use on new clothing that you might need! Sell your clothes through consignment shops! Consignment shops will take your clothes, put a high enough price on them so you can each make a nice profit. Using this method you both win! The shops get more stock to sell, and you get the stuff out of your house & make some money to boot! Call all of the consignment shops in your area & find out who has the best options for you to sell your clothes. – Mend anything needing a touch up. You wouldn’t believe it, but I also know of folks who do this as a way to earn a good extra income! They go to all the rummage type sales that they can find, buy the best of the clothes, tidy them up, & take them into the consignment shops around town. We have a few nice places in my area that have occasional .50 cent bag sales! For .50 cents, you get everything that you can stuff into a large trash bag! You wouldn’t believe the great things that I’ve gotten at those sales! My favorite finds have been – beautiful Victorian lace up shoes, and an Italian silk suit for my husband! Anyway, use those great deals to get as many nice pieces that you can, then resell them through the shops. How to Give Your Room a Designer Touch Using Old Chandelier Crystals! That’s such a great idea! I buy alot of clothes, especially for my girls, from consignment shops. I usually get name brand, great condition clothes. I know at the shop I go to, you can develop credit by dropping off clothes of your own and using that money as store credit for clothes you purchase in the future. Funny you posted about the consignment shops, I just did this last night. I took a load of my kids clothes up to the only one we have in the area. Unfortunately, she buys the stuff outright, so you don’t make nearly as much as the kind of store that sells your stuff and then splits it with you. But I did make a little bit of money, of course not as much as I would have on ebay, but I don’t have the time or energy for that. 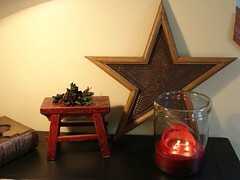 I’m a sucker for stars and stools, so I love the little corner in your home! thanks for sharing such great info, i really enjoy your blog! I myself have been in a knitting frenzy of late and cannot stop myself. My mom likes to do that and tells me to do the same but I always rush to clear out the house and then I just donate. This past summer I must have donated over three thousand dollars of stuff accumulated over the past twenty years. We thought we were moving and my husband loaded the truck and brought seven truckloads to the Sally Ann. I’m not rich and actually quiet strapped for cash these days. Maybe I should start looking at things in a profitable way. Thanks for the advice. Love the picture of your star…I really love stars! I came across your site while doing research for an article I’m writing on ways to find start-up money (consignment selling) for those wanting to start a home daycare business. I found your article very helpful.